I am looking forward to my planned exhibition in ‘The Music Room’, Eysham,Oxfordsire. My paintings will be on show for the weekend only with a private view on friday the 1st of April: 7pm until 9.30. Penelope was invited by her close friend Nicki, to bring an exhibition of recent paintings to The Music Room in Eynsham, Oxfordshire..
A percentage of all sales and the proceeds of a painting for auction will go to Pennyhooks farm which has bought such pleasure to Oliver Ginat and other young people with autism. The exhibition will be open on friday afternoon from 2 oclock and all day saturday. Penelope will be present in the gallery during opening hours and on saturday morning will be demonstrating her love of portrait painting in pastel. Please come along and support this event! Penelope Milner is a figurative artist who is constantly inspired by the beauty and intensity of the visual world. 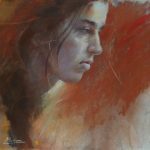 Penelope exhibits widely in France and is a key member of the national Pastel society, demonstrating and running workshops in Paris. Her work is represented in numerous art magazines, she has also won prizes with the British Pastel society and The Royal society of oil painters. The farm generates an income each year and students are funded by their local authorities. However these two sources of income do not cover all the costs especially to do with the ongoing growth of the students skills, needing additional support to develop.